There are many things that can be said about the Sailors Grave team. One is that they continue to provide an education to us here at Crafty Towers as their oeuvre grows. Here, it's their first light beer, Featherlight, forcing a bit of research. It's a Berliner weisse featuring passionfruit and Coast Everlasting; the former we get, but Coast Everlasting? Turns out it's another plant they've taken a fancy to from their coastal Gippsland home. Given we've not knowingly sniffed, rubbed, eaten or made tea with any before, it's hard to say what its addition has done, but we do know that the passionfruit is potent throughout a beer with a gentle tang, a little pale malt sweetness and a drying, acidic finish – another release highlighting the benefits Berliner weisse and their ilk are bringing to the world of low ABV beers. 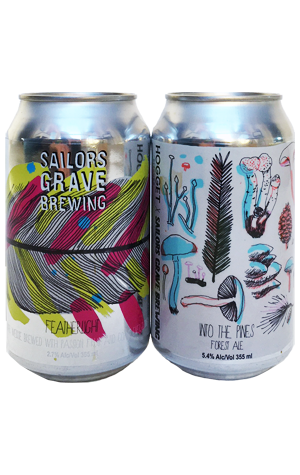 As for Into The Pines, it's a "Forest Ale" brewed with pine and slippery jack mushrooms foraged by their mates at Hogget Kitchen (and, we believe, pine needles too). Brewer Chris tells us the addition was deliberately subtle so don't go in expecting some umami-fest. Indeed, at first you could be forgiven for thinking it's so subtle as to be missed, but, right at the end, there's the impact of the shrooms, adding a little something extra to what's otherwise not too far removed from an earthy, twiggy English brown ale.